Work-related accidents abound across the country: every year, more than 4.1 million people in the U.S. suffer a workplace injury, 2 million of which are injured severely enough that they miss work and need ongoing care. About 1,000 people die each year from an occupational disease or work-related injury. Furthermore, most workplace injuries are preventable, with only a small percentage due to technical issues. After you have been injured in a work-related accident, you should report it immediately. In Texas, you have 30 days to report an injury and you should report it to a supervisor or someone in the human resource department. All you have to do, is inform your employer and send your claim to the Worker's Compensation unit. After you file, you could be eligible for income benefits, medical treatment, burial costs and death benefits (if you are a family member and a wrongful death occurred). If your claim is denied, you can contact the Division of Workers' Compensation Insurance of the Texas Department of Insurance and go to a dispute resolution conference. Keep in mind you also have one year to file with the Division of Workers' Compensation; a DWC Form-041 is available at their office. If the dispute resolution conference is also a disappointment, you can take your case before the administrative law judge in the Workers' Compensation unit. If your claim has been "shot down," one of the best things you can do, is collect more evidence. Helpful proof to have on hand includes doctor's reports, test results, emergency room reports, rehabilitation reports on your injury/recovery, witness statements, all receipts of medical expenses and any other documents that support your claim. A Dallas Personal Injury Attorney can help you file your claim, guiding you through the process of detailing your injury, medical treatment and other expenses. He/she can also handle any disputes about the validity of your claim and make sure you don't make any decisions that would hurt your claim. Your employers' insurance firm could observe you in public and film incriminating behavior that could diminish the validity of your claim, so you should be careful not to do things like exercise or participate in an activity you say you cannot do. A personal injury attorney can handle your hearings and communication between your employer and the worker's compensation insurance company and make sure that nothing illegal happens to you, such as wrongful termination. The important thing is to not waste time in filing your claim- because that is one of the most common reasons why workers' claims are rejected. Another reason why you should get a personal injury attorney on your side is because many employers disprove a worker's claim- the fact is that denying a claim decreases an employer's expenses and liability. 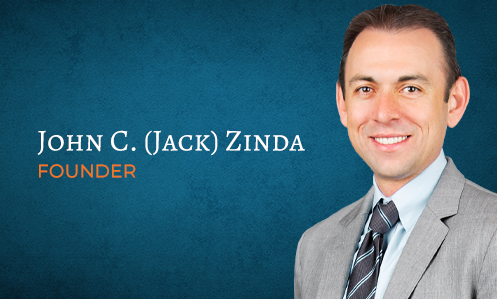 If you have been severely injured by a work-related injury or illness, give Zinda Law Group a call immediately! Our firm has the integrity and aggressive drive you are going to want representing you throughout the days ahead. The firm works on a contingency basis, so if you don't recover compensation, neither do we.